Home > ティータイム > 事前に知らせて – Let me know ahead of time. 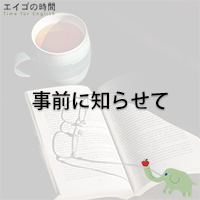 事前に知らせて – Let me know ahead of time. Please arrive at least 10 minutes ahead of time. I want to know ahead of time. You should find out ahead of time what documentation is required.